Make everything match when you order a custom checkbook cover that complements your personal checks and return address labels. Choose between leather or cloth. Leather covers are made from top-grain leather that has been buffed and texturized to remove blemishes and scars. 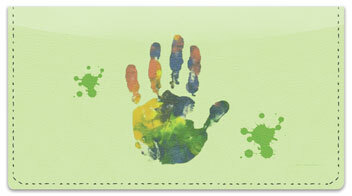 This custom checkbook cover design features one of our most popular selections. It will protect your checks and help keep you organized. Plus, it's also a stylish accessory. Add a custom checkbook cover to your order today! Don't forget, CheckAdvantage offers free shipping on all personal check products.